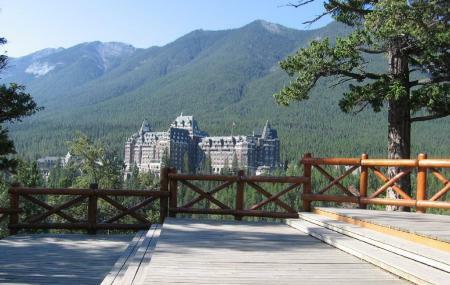 Undoubtedly, this spot in Banff will catch you by surprise. Although almost every attraction in Banff offers a breathtaking view, the surprise corner will mesmerize your senses by throwing a picturesque eye candy before your eyes. Reveal the surprise at the viewing platform across the street from the parking lot on your visit to Banff. Visit the corner at the time of sunrise or sunset to get the best of the view it offers. Don’t forget to carry your camera. How popular is Surprise Corner? People normally club together Fenland Trail and Banff Springs Golf Club while planning their visit to Surprise Corner. People also prefer to start their day with Surprise Corner. Parking will be your biggest problem here but aside from that when we come to banff we almost always come explore this area. You have to be a little adventurous to see the good stuff but you can get down to the river and see the falls from another side. Lovely, even managed to catch a train going by. This is a very popular spot for landscape photographers and even trainspotters. Definitely was gorgeous in the winter. A tiny corner that most people miss. You get an awesome view of the major hotels in the other side and get away from the hustle of Banff.